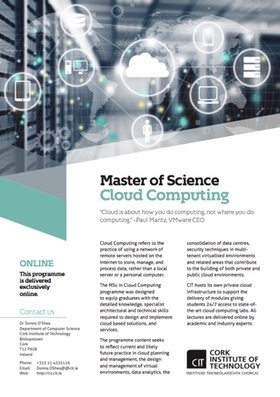 The world's first MSc in Cloud Computing, launched in 2011 in conjunction with EMC. Continuously updated with new content to ensure it remains as relevant as ever. Offered part-time online over 24 months with students located across the world. Our innovative MSc in Cloud Computing, was developed in conjunction with key industry stakeholders, such as EMC ,VMWare. The programme offers the opportunity to learn about cloud in the cloud. CIT hosts its own private cloud infrastructure to support the delivery of modules. Lectures are delivered by industry and academic leaders and are delivered online and are recorded for subsequent playback on any device. Click this link or the image over to download the programme flyer which contains links to the complete list of modules. This programme aims to produce graduates who have the required technical skills to exploit and be successful in the expanding area of cloud computing. Cloud computing is considered a relatively new field in Internet computing where novel perspectives in internetworking technologies have emerged. To successfully deal with issues relating to this new paradigm the MSc in Cloud Computing programme aims to equip the graduate with the advanced conceptual understanding, detailed factual knowledge, and specialist architectural and technical skills required to design and implement cloud based solutions and services. More recently the convergence of the cloud with big data has created additional opportunities for IT professionals to gain valuable insights into their business data. Such insights are critical for companies to maintain their competitive edge, increase their revenues and deliver new innovative services and solutions. The programme also aims to address the skills gap in this area so the graduate is equipped with not only the skills to store the data in the cloud but also to derive meaningful analytics from it to deliver true business value. The content seeks to reflect current and likely future practice in cloud planning and management, the design and management of virtual environments, data analytics, the consolidation of data centres, security techniques in multi-tenant virtualised environments and related areas that contribute to the building of both private and public cloud environments. MSc in Cloud Computing, the worlds first and best. 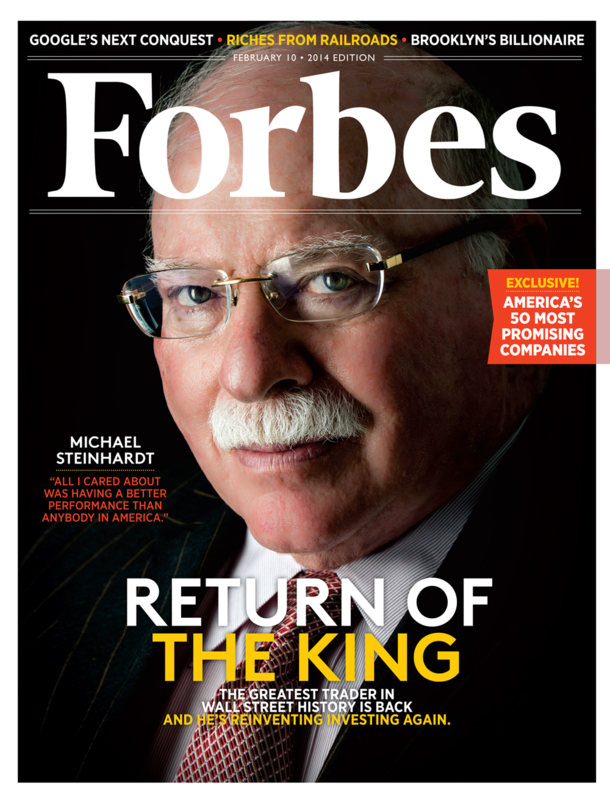 Forbes Magazine lists CITs MSc Cloud Computing programme in its roundup. Are you working in the field of cloud computing and are looking to advance your career with a professional master’s degree in the area? Are you a VMWare Certified Professional (VCP) and wish to get this certification formally recognised as part of an overall award? Are you a manager who is responsible for leading a team of professionals in the area of cloud computing or are responsible for managing migration to the cloud? Are you a engineer or software developer who wishes to learn more about cloud computing and development in the cloud? If you can answer yes to any of the questions above then you should apply now! Strategy - “A cloud strategy clearly defines the business outcomes you seek, and how you are going to get there. Having a cloud strategy will enable you to apply its tenets quickly with fewer delays, thus speeding the arrival of your ultimate business outcomes.” [ D. Scott As part of the programme students will develop skills to leverage the strategic value of the Cloud as part of an overall IT strategy for an organisation. In addition, they will learn about the develop service models associated with Cloud Computing i.e. SaaS, IaaS, PaaS etc. Please click here or the programme schedule button for full module details. Virtualisation, Storage & Networking skills - Virtualisation is the fundamental underlying technology to support Cloud Computing and is the process of creating a virtual representation of something rather than a physical. Applying virtualisation enables many benefits benefits which include economies of scale, reduced cost of ownership and reduced cost to customers for their IT functions. Virtualisation technology can be applied to servers, storage and networks and as part of the programme students will develop skills to successfully leverage virtualisation technology to enable the benefits of cloud computing for their organisation. The students will also learn how to apply these skills to a data centre environment. Security - If a cloud computing system is not secure, then as a concept it is doomed to fail. As part of the programme skills will learn the skills to secure a virtualized infrastructure in the cloud as part of an overall IT strategy. Cloud Development Skills - As part of an development elective stream in the programme students can learn how to develop next generation cloud applications in the form of microservices and develop and deploy these applications in the cloud packaged in lightweight containers such as Docker. The student will also develop scripting skills to automate the software development process and infrastructure management as part of “DevOps”. Data Analytics - Data analytics has been used as a tool in organisations to direct their strategy and maximise their projects as it enables useful insights into data. As more and more data is been stored in the Cloud, students need skills to be able to mine big data with the aim of analysing it to derive business value. At the end of this programme students will be able to fulfil a number of roles as a cloud architect, solution/systems engineer, services engineer, cloud developer or IT manager.